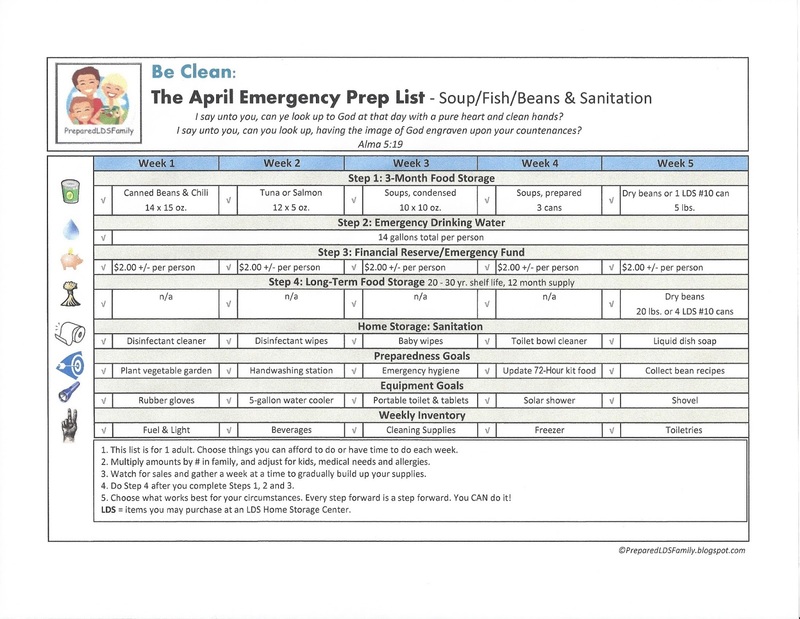 During the month of April, my emergency prep focus is beans, fish, soups, and sanitation supplies. Stock up on spiritual preparedness by attending or viewing the LDS General Conference next week. I've also created a 2016 April Emergency Prep Calendar, but it doesn't have amounts to store on it. It will be in another post. Some of you may like that format for gathering food storage. For my 3-Month food storage supply of everyday pantry foods, I stock up on prepared canned beans. There are so many to choose from: kidney, re-fried, garbanzo, black beans . . . whatever you love is what you will want to gather. Beans for salads, beans for soups, beans for chili. Beans, beans and more beans! I love our Utah case lot sales because you can find beans on sale for about 60 cents a can. This month I also gather canned fish. This could be tuna or salmon in cans or pouches. It's a great source of Omega 3 and protein. Cans typically have a 3 - 5 year shelf life, but check your product to be sure. Store bought fish mixed with other items like mayonnaise, has a much shorter shelf life. You can always find canned fish at stores like Costco and Sam's Club too. It's best stored in a cool (75 degrees or less), dry place. NEVER put food in your garage, because temperatures get too hot. Soup is another item I gather this month. There are so many possibilities. Consider your favorite family recipes to know what you want to stock up on. Creamed soups, tomato soup or prepared soups are fine. Do whatever works for your family. Condensed soups are about 50 cents at the case lot sales. Dry beans or lentils store well as long-term food storage. If properly stored with an oxygen absorber packet in #10 cans or Mylar bags, these may be kept for 30 years. However, learn how to cook with dry beans before you stock up. Some of you have dry bean knowledge, however I'm pretty weak. So look for some recipes. During the Utah case lot sale, you can find 20 lb. bags of black beans for about $18.00 and pinto beans for $16.00, but you can always buy a 25 lb. bag of black or white beans at the LDS Home Storage Center. No one likes to talk about emergency sanitation and hygiene, but it's so important. 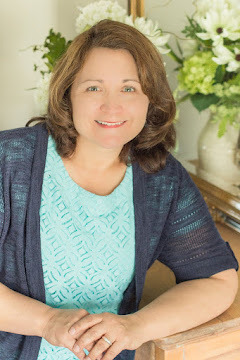 Our bodies have to do their thing, and we have to learn how to deal with it if there is an emergency. Those of you with little children should have a good supply of baby wipes and diapers around. As a grandma I have some too in case my grand-kids need them. 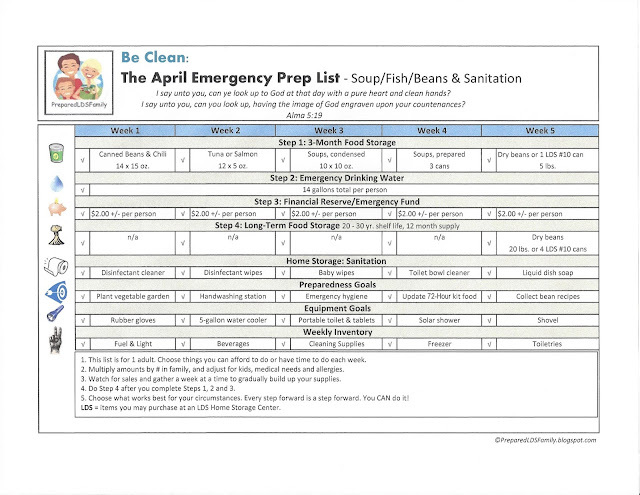 Study how to stay clean during an emergency. Clean hands saves lives. Good luck with your preparedness goals! You are never behind. Any step forward is still a step forward. with a pure heart and clean hands?